It is a fact that Europe is facing numerous challenges: while day in day out across the continent people reap the benefits of a Europe open for travel, investment and interaction, there are more than a few clouds on the political horizon. Discussions in many Member States of the European Union seem increasingly focused on national interests. When appeals are made to solidarity it is mainly by those expecting to derive some direct national advantage. The overarching idea, however, should surely be the removal of barriers and the promotion of peace and mutual prosperity. The recently expressed idea of a Europe of different speeds is, of course, an attempt to keep the train moving forward with all passengers on board. But it is hard to recognise anywhere in such suggestions the spirit of a united Europe. 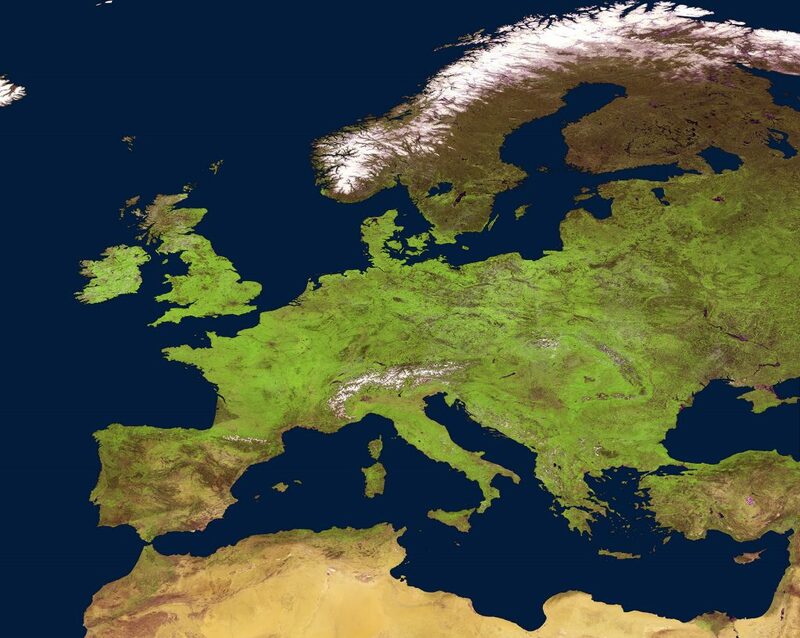 Springtime in Europe, as seen by ESA’s Proba-V satellite. Image: ESA/Belspo – produced by VITO, CC BY-SA 3.0 IGO. In addition to these considerations of how to rescue the European spirit, at least in part, we have to engage with the challenges facing the Earth as a whole: we should be aware that while we need this planet, the Universe does not need planet Earth and the Earth does not need humans. What would an alien think if he or she were to look upon the Earth and observe what we are doing and how we are interacting on this small blue dot? I am quite sure he or she would not be convinced that there is intelligent life on this planet, with members of the “highest” species fighting against each other to gain some expected advantage while at the same time forgetting about how to bring about a sustainable situation for future generations. What is true for our planet is equally true in respect of the European situation: instead of looking each and every day to gain advantage on a personal, institutional and national level, we should reflect on the European spirit and ideals which have brought us so many achievements in the last few decades. ESA with its unique structure allowing Member States to exert direct influence on programmatic decisions and comprising the fundamental instrument of “geo return” supports interaction within ESA but it too is experiencing a singularisation of interests. Micromanagement, demands for geo return in each and every programme and decoupled boards and committees are endangering the truly inspiring spirit of the ESA Convention. Although the document, written in 1975, has been incorporated into national law by the national parliaments of all ESA Member States, we have to anticipate the changes and challenges that lie ahead. The ESA Convention must not prevent us from making changes but at the same time its original spirit should be maintained. Space is an area of worldwide interest which delivers for society, the economy and geopolitics and has enormous power to fascinate and inspire. It is up to us to harness and further develop this power for the sake of Europe and beyond, bringing together the different players in a spirit of cooperation, with all vanities set aside. In this understanding, a “United Space in Europe” becomes one of the cornerstones with ESA as THE European Space Agency, adaptive, accountable and agile. I voted to stay in EU because I liked calling myself a European. I agree that a USOE is a good plan. Movement of people should be carefully controlled though so that countries are no overwhelmed. You do realise regardless wether you voted in or out for Brexit you are still European?? The U.K. won’t be picked up on the back of a star ship destroyer and dropped off in Africa. Europe is a continent and the U.K. will always be a part of it and hence you will always be European! The vote was for the European Union which is an agreement not a geographical inhibitor. You are still a European outside of the European Union doh! EU is the future. All positive visions of future society are of a unified world, much like what Europe is heading towards. Hopefully the rumbles of the past few years will pass and EU will be joined in its endeavor by similar projects around the world. I was in my early teens when my country joined and I love the EU. When I travel outside of Europe and someone asks where I’m from, I proudly respond that I am European. I urge the people who hold political power today to not ruin it for us-their children for their petty conflicts. What is the meaning of “Micromanagement, demands for geo return in each and every programme and decoupled boards and committees are endangering the truly inspiring spirit of the ESA Convention.” From the head of ESA I would expect some understanding that maybe what he calls a micromanagement is closely linked to the success rate of ESA missions in past decades? This DG post is attacking the ESA convention, without giving any hint what in particular is wrong with the ESA convention. This is simply a wrong message. Also “United Space in Europe” has zero contents. After reading some materials about it and watching a video presentation, I note that it is just a new label for ESA. Maybe good marketing, but we need more substance. I agree. There are many obstacles to overcome, social, educational etc. There should be a new way to look at competitiveness and the role money plays in a society. Science should be defined as something everyone can be part of. At the moment people still have the impression that science is preserved for a selected few, which is not at all. It is refreshing and stimulating for an average person to read scientific papers and still feel the he/she can make a difference. Do you think private investment in space exploration can prove as fruitful as public investment? It fills me with confidence that the Director General of such a large organisation is focused and aware of the such important issues. I agree strongly with this statement. We need to convince people to be less selfish and realise working together and sharing responsibility is the way forward. I would be happy to have a dual nationality British & European. I suspect “micro-management” in this context refers to nations narrowly pursuing geo-return in specific ESA programmes. But this can distort a merit-based approach to procurement. Perhaps, a “big-bucket” approach to funding is simpler, fairer and maximizes success? Experience/Merit/Knowledge is not the key factor but the right nationality. Is this really Space 4.0, or is it more like 0.4? I think we are going backwards. your subtle criticisms regarding the way the MS interpret the geo-return goes along the line of the frustration that many people already working at ESA or trying to work for ESA experience. Not having a possibility to be hired because not having the “right” nationality (geo-return) generates frustration. I am not sure that this helps to have a European spirit at ESA. I felt more European before joining ESA. At ESA, I learned that nationality matters. At ESA, I see that we are not European: I am Spanish, you are German, he is French, she is Swedish. That does not help to feel the European Spirit. I don’t enter here the discussion whether such process allows really to hire people with the right skills other than the right nationality. Does this guarantee diversity at ESA? Probably yes. Does this affect the quality of the work done by ESA. Surely yes. I disagree with a “United space in europe”, It lead to dogmatic thinking and a muddled diversity in thought and action. The different inputs from member states is essential for a functional organisation. It should never be be or shouldnt be a united space in europe because it could diminish the influence of smaller states and eventually lead to the breakup of any organisation (wether it is esa or another organistation). The best way is to emphatise the importance of scientific reasearch, the common goals of member states and the progress it could enchance in scientific, economic/buisness/community and exploration sense and value and also to focus to have an overall European perspective for what its’ citizen value and a common objective/goal, like access to human space flight or capability to launch human spaceflight via ESA or/and research station or/and habitats on other celestrial objects, like the moon, venus and mars. I believe A common goal for european nations, Space For Europe is a good objective. Space for Europe is a more open wording phrase that encourage cooperation in Europe. While United space in Europe, empthasie “united” which it’s not, most member states have different opinions what is good and bad for their member states or what the organtistaion should be doing. And to say there is a “united” space in Europe or to empthaise on it would be a misstake. Also it’s important is doesnt sound or try to mimic the US in any way. Europeans Should empthaise on collabration between nations especilly for europe but also ofc with other space agencys in China, USA and Russia etc. And the phrase “united space in europe” could lead to more division between member states and less collabration, it’s not good to empthaise on an artificial unity, but to empthaise on the common goals for Europeans and its’ nations and to create an organic and symbiotic unity between Europeans and its member states with Europe. It shall not however diminish independent countries soverignity but benefit all europeans without damaging any state/country. A strong EU, but without dimininshing member states soverignity and independence, solidarity and common goals for a better Europe but not by oversimplifing and trying to create an aritfical unity.